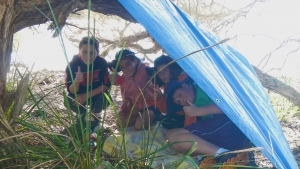 These bushcraft challenges are designed so that students co-operate as part of a small group to select and utilise a variety of equipment to simulate an overnight camping experience with limited gear. 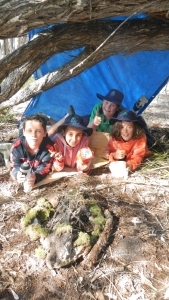 These activities are usually based at the Field Studies Huts or the Hobart Beach Camping area and are often run alongside challenge games, peer support or leadership activities. How can I work together with others in cooperative situations to enhance the contribution of myself and others? Can I suggest, consider and select appropriate alternatives when I am resolving problems? What are the consequences of the decisions that I make and can I take responsibility for the outcome? A scenario is described to students: An overnight expedition into an area of forest which can become very hot during the day and cold and wet at night. The exact location of the campsite is uncertain. 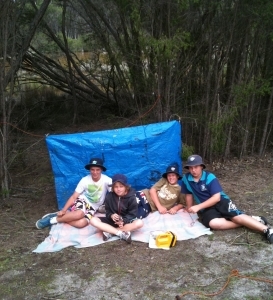 A shelter will need to be constructed and at least one meal prepared. No toilets or communication are available. Snakes and stinging plants are common. A compass exercise is undertaken to ensure that students are familiar in the use of this equipment prior to the start of the program. Each group choose from a selection of items. Only ten items can be taken. Clues are given as to what items may be needed. At a determined location in the National Park, the groups are given a Survival Challenge task card on which several tasks are required to be undertaken. Groups are assessed on each aspect of their performed tasks. During debrief, staff and students share observations, successes and deficiencies. Students are asked to consider how they might approach the task if it were repeated. Acts in ways that enhance the contribution of self and others in a range of cooperative situations. Applies movement skills in games and sports that require communication, cooperation, decision making and observation of rules.